At least 8 people have been reported killed and at least 11 injured in a vehicle attack near the World Trade Center memorial in lower Manhattan, New York City. Police have the driver in custody and are investigating the attack as terrorism. Six people were reported dead on the scene, and two others were pronounced dead at the hospital, another 11 were transported to the hospital with “serious, but not life threatening” injuries, NYPD Commissioner James O’Neil told reporters. O’Neil said that the suspect was a 29-year-old male. He said that the man had a paintball gun and a pellet gun, pointing them at people. The suspect was hospitalized after being shot in the stomach by police. The suspect had exited his vehicle after striking a school bus, with two adults and two children inside. The suspect left the vehicle “displaying imitation firearms” and was shot by police officers before being taken into custody. Police said that a vehicle entered the bike path “a few blocks north of Chambers Street” where it “struck multiple people.” They added there there are “several” fatalities and “numerous” people injured. CBS News reported the identity of the suspect as Sayfullo Habibullaevic Saipov from Tampa, Florida. ABC News and other outlets have reported the same, based on police sources. The incident is being investigated as a possible terrorism attack, an anonymous law enforcement source told Reuters. Fox News and CNN have reported the suspect yelled, "Allahu akbar," Arabic for "God is great," before being taken into custody. The suspect allegedly struck more than a dozen people while driving through the bike path for at least 10 blocks, according to NBC News. Police said that the suspect deliberately hit a school bus and witnesses said that they heard the driver yell “Allahu akbar” before exiting the vehicle. The FBI is now treating the incident as a terrorist attack, according to CNN. Heartbreaking news coming out of NYC. Praying for the victims. New York City Mayor Bill de Blasio and Governor Andrew Cuomo headed over to the scene of the crime, where they were briefed on the incident alongside New York Police Commissioner James P. O'Neill, the Washington Post reported. 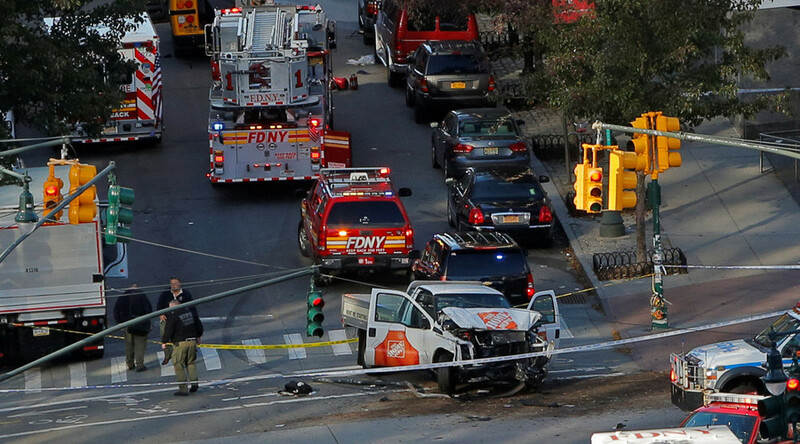 A spokesperson from Home Depot confirmed one of their rental trucks was used in the attack, CNN reported. A video taken at the scene shows multiple injured bikers on the ground. The poster said they they were hit by a truck. Facebook has implemented its Safety Check feature. Witnesses saw a truck hit several people, the Associated Press reported. An AP photographer reported seeing two motionless bodies covered with tarps. Of the eight people killed in Tuesday's bike path attack, five were citizens of Argentina, and one was a Belgian native, the AP reported, citing foreign ministers. Belgians and Argentines are also among those injured in the attack. Argentina's Foreign Ministry confirmed the deaths, and the foreign affairs minister of Belgium confirmed the death of a citizen from his country in a tweet. Argentina's Foreign Ministry stated that the Argentine victims were friends traveling in a group to New York, from Rosario, Argentina. The ministry said it stands “with the families in this terrible moment of deep pain, which is shared by all Argentines,” according to the AP.